Looking good Robert.. .big improvement was making the site responsive depending on device..looks great on Samsung Galaxy Note 4. The Injectors I went with are nearly roughly 27% larger.. I wouldn't run E10 in it..would be way too rich.. although the ECU "may" be able to adjust to that extreme? I'll test pne of these days and let you know. Morning Rick, I sent a message to the ebay seller that I purchased my fuel injectors from to see if he can find out which injectors will work for you. ..I told him you wanted 20% larger.. that should allow you to run some gasoline as well if ever needed . Best conversion I ever did was with the larger fuel injectors.. for the Jeep it works perfect . Zero issues AND keep in mind larger fuel injectors does not mean you will automatically lose more mpg.. ecu will only send as much fuel as you need AND if it makes the correct adjustment and gets you near lamda to we're combustion is near perfect you may actually see better mpg. Here's the consideration I used.. 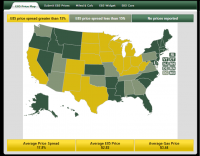 If they wont pay $1.99 then they have no real interest in E85 AND if it is free that means anyone and everyone will download the APP and start posting bogus prices.."just because they can" . Look how the yellow is filling in since the beginning of the Months .. I'm really disappointed in Jay.. He has supported ethanol and E85 in the past ..He HAS valid concerns with ethanol and vehicles with cork gaskets and such but (which is why you replace those in older vehicles) and ethanol will clean out the sludge .. that's a GOOD thing if you know what to watch for but then he goes too far off to to the right simply echoing anti ethanol propaganda. It read more like something that was given to him ..
South Dakota Offers Infrastructure Funding - AGAIN! Robert what is the average cost including installation these days ? 1. Standard Blender storage tank 1 Standard 87 Octane , E15, E50 & E85 Versus 1 stand alone E85 pump ? Morning Rick.. Yes all the press was that the Volt would be E85 Capable and then came to market without it... Engine is we know that ..so I'd sure like to see the Fuel Map optionsa.. any chance their is a check box..enable flex fuel 60/70% and you throw the CEL..as you already know that doesn't (necessarily) mean you are running lean, hook up your gauge and I'll bet you see Short fuel trims right in line.. Thanks everyone ! Going to be nice to have a little extra free time.. some of us will be working a little more though..umm Aaron I know your busy but can you take care of these new E85 Stations please http://e85vehicles.com/e85/index.php?/topic/6845-a-host-of-new-thorntons-locations/&do=findComment&comment=44987 Really happy to see Aaron officially on board.. you'll do a great job promoting E85 and keeping the Station database up to date I think its going to be good for everyone.. I was falling behind on a lot of things for the websites..just not enough hours in the day and I was running myself down trying to make more time . so with the RFAs resources they can split/ hire out the work load..get caught on the things we are behind on ..like updating the E85 vehicles pages ...getting the APPs updated etc..